Fire on the Mountain: May '70: 15. Phillip Gibbs. James Earl Green. Murdered. May '70: 15. Phillip Gibbs. James Earl Green. Murdered. When a unit of the Ohio National Guard wheeled and aimed at Kent State students on May 4, 1970, they fired an estimated 61-67 shots. 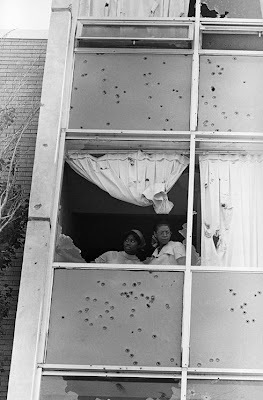 At five minutes after midnight on May 15, local police and state highway cops ordered out by Governor John Bell Williams opened a barrage of at least 460 rounds, mainly from shotguns, at Black students gathered in front of a women’s dorm at Jackson State College in Mississippi. When it ended more than half a minute later, Phillip Gibbs, a sophomore and father of eighteen-month-old Demetrius, lay dead with two OO buckshot pellets in his head, a third beneath his left eye and a fourth under his left armpit. 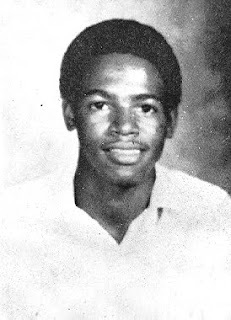 James Earl Green, an 18-year-old high school student headed home from his grocery store job, had fallen on the other side of the street, behind police lines, the left side of his chest blown away by a shotgun. Only after the cops had spent 15 minutes or so picking up their shell casings were ambulances called to pick up the dozen or so wounded, and those injured by shattering glass or trampled as people fled the fusillade. As with the police murders of six young Black men in Augusta, GA days earlier, the media accorded this massacre very different and relatively minimal coverage compared with that given to the students massacred at Kent State. Over the years I’ve heard all sorts of rationalizations for the downplaying of the Jackson State killings. We knew better then, and we should know better now. The protest at traditionally Black Jackson State was a roiling unorganized thing--as it was at many predominantly white campuses. The three main demands weren’t front and center--and they weren’t at many predominantly white campuses. So what? The students were riled up by clashes with racist motorists driving by the campus, and a rumor had spread that local Black leader Charles Evers had been shot down. This was not a hard rumor to believe: his brother, civil rights activist Medgar Evers, had been gunned down only seven years before by a Klansman (who was walked by an all-white jury). And they knew that campuses all over the country were erupting in struggle. So when Jackson State students and local youths started chucking rocks and setting things on fire, they were very much a part of the upsurge that was shaking the country to its foundations that May. All the more so as one of those things was the campus ROTC building! From that day on, those of us who battled our way through May 1970 have made a point to remind people who speak of Kent State that we must never forget Jackson State. It’s an uphill battle sometimes against historical forgetting, but it is one that won’t cease while veterans of that struggle remain. And while Kent State administrators spent years trying to bury the massacre there, to their credit, the Jackson State administration, dependent though it was--and is--on overwhelmingly white state education authorities for money, has never repaired the stairwell at Alexander Hall, pocked by 160 bullet and pellet holes. All entering students see the evidence and hear the story of May, 1970, when an organized and heavily armed group of cops, dispatched by the governor, couldn’t intimidate protesting students and finally opened fire on what is now their new home. Dennis, thanks for publishing this. 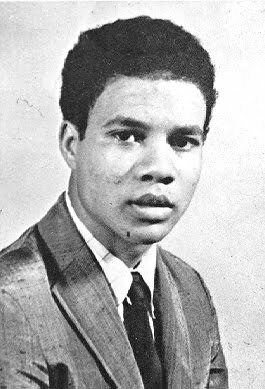 I was a 15 year old sophomore at Phillips Exeter at the time of the Kent State and Jackson State killings. The (mostly white) student body was up at arms over Kent State, as was true for most campuses (although this was a HS, not a college, hence different than your experiences). But for Jackson State, it was different. I remember well that a very young Black teacher, Mr. Earl Belton, and a Black senior got up at the daily all-school assembly and chastised us in no uncertain terms for our more limited reaction. I can't remember their words precisely but i recall feeling shame -- as did many others -- for the double standard. Two years later, in the fall of 1972, some Black students were killed in a protest at Southern University, an historically black college in Louisiana. I remembered at the time the words of Mr. Belton, and, then a freshman at Columbia, I joined the protest against the killings. And there I met members of the Columbia Anti-Imperialist Movement... and the rest was history, as they say. One other minor (but possibly interesting) factoid. One of the leaders of the Phillips Exeter response / protest to Kent State was current WH counsel Bob Bauer. Hello. Thank you for posting this. I was wondering if you could help me with the origin if this source. I am doing a historical investigation and need help filling out the origin part. Thank you.